For anyone who has quickly checked their Facebook account at a party only to see friends having considerably more fun – don’t worry, you’re not alone. A fifth of 1,010 13- to 17-year-olds surveyed for The Children’s Society who looked at social media at Christmas said friends were having a better time. And nearly a third said a gawp at Instagram or other social media brought the green-eyed monster out over gifts. But 40% said social media made them think more about those less fortunate. Three-quarters said they spent more time than usual over Christmas on social media, mainly to see what their schoolmates were doing. And 47% said they did not spend enough time with friends during the festive break. 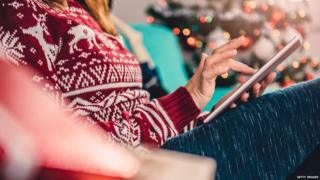 The Children’s Society chief executive Matthew Reed said social media could be an “important lifeline to the outside world” during the stresses and strains of a family Christmas. “Many miss their friends whilst not at school and social media can represent an important lifeline to the outside world. He also urged parents to remain aware of what their children were doing online.